The Brown and Pink Dear Jane is finally finished! My journey with Jane started in April 2011 with 25 of the blocks given to me from my quilting friends for my 50th birthday. I decided to only make the center the blocks, there are 169 of them, and two years later it is finally finished. In April 2011 I had the opportunity to go to Brenda Papadakis class in Asilomar. There I was able to meet other Janiac's, learn many of the tips and tricks to making the blocks, and spend time with Brenda-she is an amazing woman. Last year, in June 2012, I returned for a second time to Brenda's class in Asilomar and reunited with other classmates from around the country. We had some finished quilts to celebrate and worked on more of those addicting blocks. 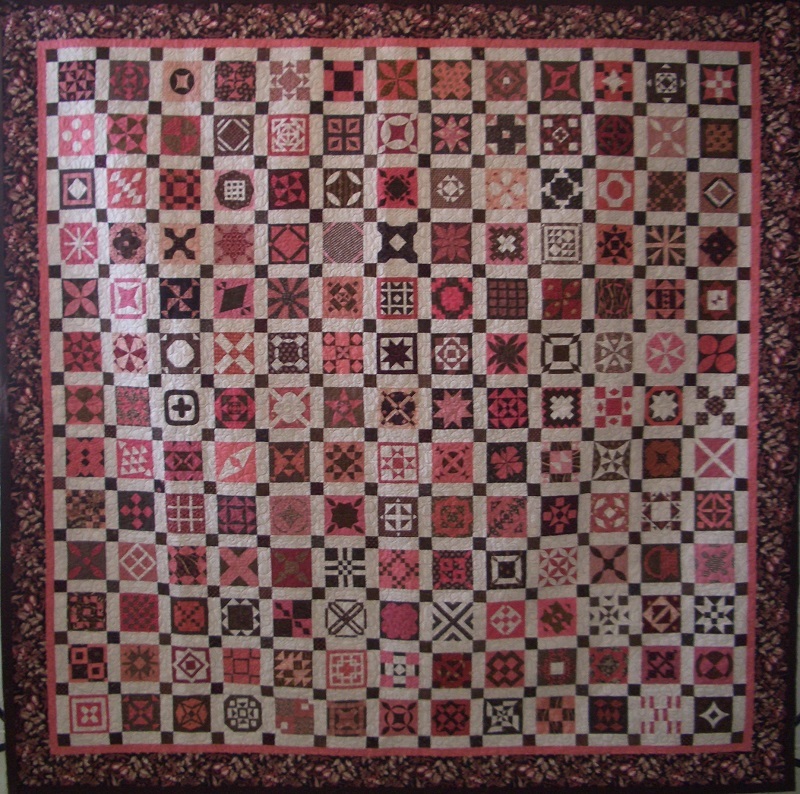 My goal was to finish the quilt in time for Brenda's class in 2013. 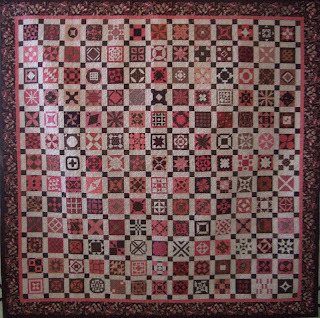 Fast forward to March 2013, and with the help of my friend Sandi, and lots of encouragement from DH, I was able to complete the quilt in time for my class at Asilomar last week, and get started on the Red/White/Blue DJ. Unfortunately, Brenda had a fall and broke her arm and was unable to teach, but Laura Fraga stepped in at the last minute, and did an outstanding job. Laura is a applique expert and taught us all her tricks-we all became experts by the end of the week. She also showed us different ways to make some of the trickier blocks. Thank you Laura!! This was my extra credit #13 UFO and unfortunately the March UFO, Jeweled Trees, was not touched. Will have to add it to April! Yay! It looks beautiful, Mom! Fabulous Quilt, it looks amazing. Dear Jane is really great, this one I am sure is a treasure, a lot of memories attached to this one. Yay! It is beautiful. What a treasure. Every day you look at it you can celebrate yourself. Sunday Stast Report March 31, 2013.